Ciano are a Portuguese company that have developed a reputation for offering integrated aquariums solutions that help the aquarist ensure effective and optimal support for plant life and fish with their quality products. The Ciano team have created and produced aquarium products that demonstrate quality and innovation for over twenty years. 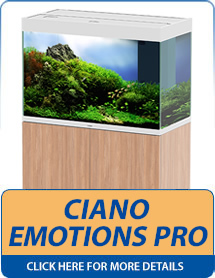 The range of Ciano aquariums available include the stylish Emotions Pro and Emotions Nature One aquarium systems. Don't forget that Aquahome also offer in store finance on all aquariums over £300 which means that you are able to spread the cost of your chosen aquarium over 12 months interest free, or even spread the cost over 2, 3 or 4 years (interest bearing)! For more information please see the Aquahome Returns Policy and In Store Finance Information. 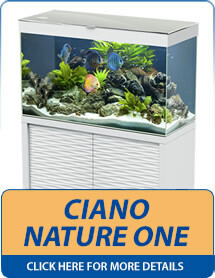 Please click below on the particular Ciano aquariums that you would like to view in more detail.